If you are not as familiar with Affirm as you are with Visa, MasterCard, American Express or Paypal you may soon be. Imagine you are at an online checkout about to buy furniture or airfares and realize you don’t have the cash available to pay the full amount right away. What do you do? If you are like most people, you close the browser window or visit another website. Even if you do have the money but you know you’ve got an upcoming bill due and want to keep enough cash on-hand to pay it, you probably don’t checkout. But what if there were a way to pay for the things you wanted without resorting to a credit card or visiting a bank to get a loan? The answer is an increasingly popular payment option called Affirm which lets you purchase your goods via fixed monthly payments. Within 3 to 12 months, your fixed payments end and you get to own your goods free and clear without having to drain your cash reserves at the time of purchase. Why Choose Affirm Personal Loans? How Much Does An Affirm Loan Cost? If you can’t afford to pay for an item at checkout and don’t have a credit card or have poor credit, Affirm lets you pay in monthly installments for the item over 3, 6 or 12 months. To understand how Affirm is different, consider the traditional payment options available to consumers who want to purchase higher priced goods. If you want to pay for a vacation deal you spotted online or buy a new piece of furniture but don’t want to drain your cash reserves, a credit card would be the obvious choice. Another possibility would be to approach a bank or credit union to apply for a loan. But what if you have little credit history and can’t get a credit card or you don’t want to go through the hassle of filling out lots of forms with a traditional lender? 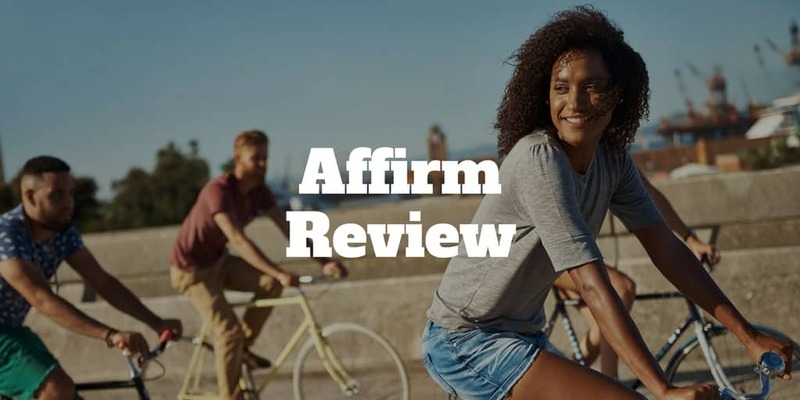 Affirm helps you in these situations because it acts as a mini-lender bridging the divide between credit card companies and larger loan issuers. You don’t have to jump through the same hoops required by traditional lenders, and if you don’t have a credit card or have poor credit, you can still purchase the goods you want at the point of sale. Plus, Affirm never conducts a hard credit check so, unlike a credit card company or traditional lender, your credit score won’t be hit when you pay with Affirm. Perhaps the best aspect of Affirm is that approval is immediate at the point of sale. You don’t have to wait for even a single business day for loan approval. Affirm uses its own technological wizardry to instantly provide approvals when you provide them with some basic personal details. For the 40% of young adults who say they have no interest in using a credit card, according to MillennialDisruptionIndex, Affirm offers a way to purchase goods over time by relying on proprietary algorithms to calculate the creditworthiness of users. To pay with Affirm, simply choose the Affirm payment option when you are checking out online. Once you get to the checkout page, you will have a choice to pay by credit or debit card, or Affirm. 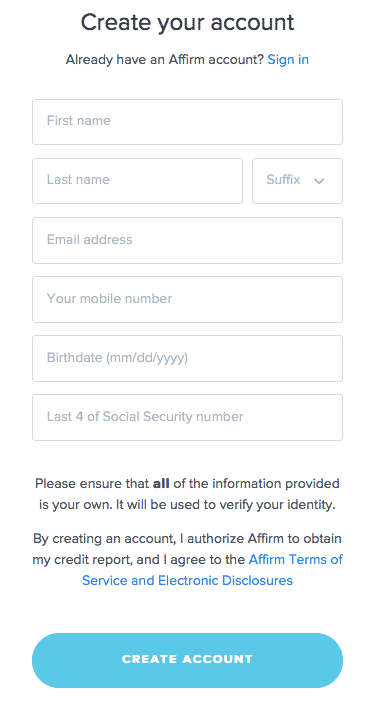 When you choose to pay over time with Affirm, you will be invited to enter some personal details: name, email, mobile phone number, birthdate, and the last four digits of your social security number. 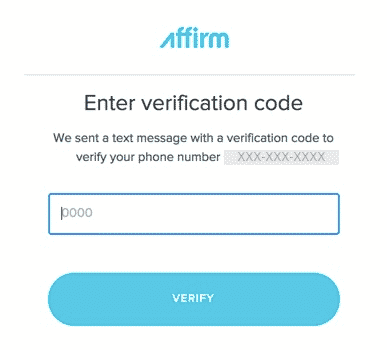 Once you have created an account, Affirm will send you a text notification to ask you to verify your account by entering a confirmation code. Once confirmed, you are all set to go shopping at one of the many stores that has integrated Affirm into its checkout page. Affirm loans span 3, 6, and 12 month durations with interest rates ranging from 10% → 30%, though a few select merchants will offer 0% financing. You will not be charged any late, prepayment, or other hidden fees. Affirm loans start at $50 and are designed to help you pay for higher priced goods that may otherwise be out of reach. Interest rates on loans vary from 10% to 30% APR simple interest. No other fees are charged, so you won’t be hit with late fees, service fees, prepayment penalty fees, or any other hidden fees. Shorter term loans will cost you more in monthly payments but cost you the least in interest charges. It is best to consider your monthly budget as well as interest charges when you select your loan term. 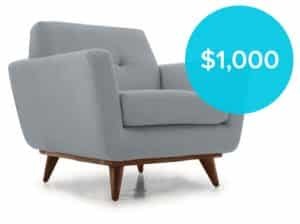 Imagine you find that dream furniture piece you’ve always wanted and discover it costs $1,000 – more than you wanted to spend today. You decide to pay with Affirm and discover that the APR rate is 20%. How much would the $1,000 item cost you over the duration of a loan term? As you can see, the longer the duration you choose, the more you will pay in interest but the lower your monthly payment. If you can afford to pay off the loan over a shorter time period, it is best to choose that option to save on interest but a longer duration may be better suited to your overall budget. You will need to make the best choice based on your own financial circumstances. Affirm instantly approves loans starting at $50 at the point of sale without hurting your credit score and can be paid back in monthly installments over a period of up to 12 months but APR rates are quite high so make sure to calculate your total interest charges and financial budget before checking out. ✅ Immediate Approval: You don’t have to wait for days or weeks to get approval as with traditional lenders but instead can be approved immediately at the point of sale when checking out online. ❌ High APR Rates: APR rates range from 10% → 30%, which at the low end are competitive but at the high end rival credit card rates. ✅ No Hidden Fees: You won’t be charged any late fees, prepayment penalty fees, or other hidden fees. ❌ Competitors: Rival firms such as SoFi have lower rates but they tend to have more stringent and longer application processes. ✅ Short Term Mini Loans: Loans can be issued for as little as $50 and as much as $10,000 for periods of 3, 6 and 12 months. ✅ Credit History: If you have little or no credit history, you may still be eligible to pay with Affirm, which relies on its own algorithms to verify user creditworthiness. ✅ Soft Credit Check: Your credit score won’t be hurt with a hard credit check as is the case with most traditional lenders and credit card applications because Affirm performs only a soft credit check. ✅ Secure Payment: Affirm doesn’t use standard credit card numbers to process transactions so it adds an additional layer of security to your personal financial details. ✅ Low Application Hurdle: No minimum credit score, minimum gross income, nor minimum credit history is required and and no maximum debt-to-income is stipulated to be eligible for a loan. Affirm was founded by the co-founder of Paypal, Max Levchin, and the co-founder of Palantir Technologies, Nathan Gettings, as well as Jeffrey Kaditz, formerly of Microsoft. Most everybody knows about Paypal these days but Palantir is a less well-known company that most recently was valued at $20 billion. Together, the founding team has raised $520 million since starting their Fintech company in 2012. Affirm solves a problem for both consumers and businesses when checking out online. For consumers, Affirm offers a way to pay for items in monthly installments for anywhere from 3 to 12 months. And for businesses, who regularly lose sales when customers decide to walk away from a purchase because the purchase price of goods are not immediately affordable, Affirm increases sales conversions. Critics argue that Affirm makes it easy for consumers with little or no credit to buy goods that would otherwise be unaffordable. However, consumers who really want or need to purchase items and lack the cash may find it is the only simple solution to finance a purchase. Taking out a loan from a bank or credit union, or relying on a credit card may be even more expensive or take a lot more time whereas Affirm enables users to get financing during the checkout process. We believe Affirm offers an alternative means of paying for goods that may otherwise cause consumers to resort to much more expensive options, such as payday lenders, and so it provides a valuable service. However, if you choose to use Affirm, look to shorter time periods where possible in order to lower interest costs.